Senator and reigning WBA “regular” welterweight champ Manny Pacquiao has reportedly signed a deal with the influential Al Haymon and according to The Philippine Star, the boxer-turned-legislator will engage in a “tune-up” fight in Las Vegas on January 19. This serves as a “warms up” for the planned rematch with Floyd Mayweather Jr.
Pacquiao fights either Andre Berto or Adrien Broner. It would be his comeback fight in the US. Pacquiao, has not fought in the United States of America. His last U.S. fight was on November 2016 when he won a very convincing uninanimous decision over Jessie Vargas. Adrien Broner, 29-years-old, is a former world champion in four weight classes, being the WBO junior lightweight title holder from 2011 to 2012, the WBC lightweight titlist from 2012 to 2013, the WBA welterweight king in 2013, and the WBA light welterweight champion from 2015 to 2016. Andre Berto, 35-years-old, is a two-time former welterweight world champion, having held the WBC and IBF titles between 2008 and 2011. He was also the WBA interim titlist in 2015. As an amateur he won the National Golden Gloves tournament in 2001 at light middleweight and 2003 at welterweight. He also represented Haiti at the 2004 Olympics. 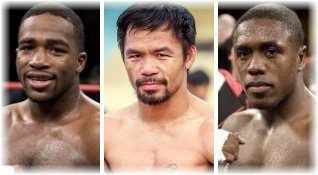 Top Rank CEO Bob Arum does not consider Shawn Porter or Keith Thurman as dangerous fighters for Terence Crawford. He rates Errol Spence Jr., the IBF welterweight titlist, as the legitimate opponent for Crawford to challenge the WBO champ in a unification. After Crawford’s successful 12th-round stoppage of Jose Benavidez Jr., Arum is willing to promote a Crawford-Spence showdown next. The prospective unification needs the cooperation between Arum and Al Haymon, who handles Spence, since the two champion boxers were supported by different networks. But Arum deduced that ESPN who signs Crawford and Showtime who contracted Spence could work harmoniously on potential pay-per-view match. As of June 2018, Spence is ranked as the world's number seven boxer, pound for pound, by The Ring. He is also ranked as the world's top welterweight by the Transnational Boxing Rankings Board, second by The Ring and BoxRec. In 2009, Spence won the U.S. National Golden Gloves, and also won three consecutive national amateur welterweight championships from 2009 to 2011. The Terence Crawford-Jose Benavidez fight earned huge ratings for Top Rank on ESPN. The overall event resulted in a 1.6 metered market rating according to Nielsen, making it the highest-rated boxing television show in 2018 over all broadcast and cable networks. The main event, Crawford vs. Benavidez, averaged a 1.8 metered market, becoming this year’s highest-rated Top Rank fight and main event on ESPN. The featured co-main event between Shakur Stevenson vs. Viorel Simion was also a big success for ESPN, scoring a 1.3 metered market rating, and elevating it as the year’s second highest-rated Top Rank on ESPN event. Amir Khan will fight rival Kell Brook in February or March next year after the planned match with Manny Pacquiao went for naught. Pacquiao is eyeing a rematch with Floyd Mayweather. Khan declared that nothing can stop him from fighting Brook, but the Bolton boxer is disturbed by Brook's weight demands. Khan stated that both fighters should weigh in below 147 lbs.on the day, with a 10 lbs. rehydration clause in the contract. But Brook stated that he will eat whatever he likes because there will be no rehydration clause for their bout.